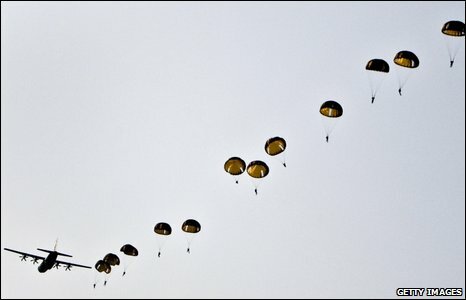 Battle of Arnhem veterans watched as hundreds of soldiers parachuted over southern Holland, 65 years after the operation nicknamed "a bridge too far". After the display by 900 British, Dutch and US troops, veterans attended a memorial service. The September 1944 battle saw 20,000 Allied soldiers dropped behind German lines to capture bridges. More than 1,500 British troops died. 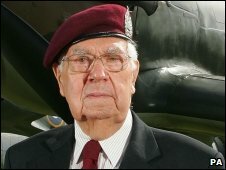 Major John Merrylees, of 4 Para, called Saturday's display "quite a spectacle." He described conditions for the jump as "perfect", but warned "fewer and fewer" veterans were able to attend such services." The operation, the brainchild of British Field Marshal Bernard Montgomery, was commemorated in the 1977 Hollywood film A Bridge Too Far. Arnhem veteran George Barton, 89, from Slough, Berkshire described how he came to be captured during the operation: "The anti-tank gun I was looking after was hit by a tree that fell from above and put it out of action. "I went to tell my colonel and by the time I came back my men had gone - I didn't know where they were. "We hadn't eaten properly for days, so I went off looking for food." He added: "I found a greengrocer's shop - it had a cellar and in it were sacks and sacks of apples. "Having gorged myself I must have fallen asleep and the next thing I knew I woke up and there were three German soldiers in the cellar looking at me." Mr Barton was held in prisoner of war camps until being freed in April 1945. On Sunday Prince Philip and Defence Secretary Bob Ainsworth will attend a memorial service at Oosterbeek Cemetery, near the site of the battle. Schoolchildren will place flowers on the graves of Allied soldiers killed in the action. But with the number of survivors dwindling it has been suggested this year's events could be the last commemoration of the battle.